John Molloy Gallery is pleased to present Languages of the Heart, an exhibition featuring indigenous and contemporary art, opening Thursday, February 21st from 6:00 - 8:00 pm. The exhibition is on view from February 14 through March 16, 2019. Languages of the Heart, guest curated by Colin Thomson and Lindsay Walt) is conceived as a visual call and response by contemporary artists to Native American and other indigenous work. The show is installed in pairings with each contemporary artist selecting an indigenous piece. All indigenous pieces are by anonymous artists while contemporary artists include Cat Balco, Laurel Farrin, Glenn Goldberg, Jill Levine, Lizzie Scott, Colin Thomson and Lindsay Walt. In The Gutenberg Galaxy (published 1962), Marshall McLuhan describes an earlier oral culture as communicating in 'languages of the heart'. With the invention of the printing press, a new standardized means of communication made text an archetype. McLuhan, a Canadian professor, philosopher and public intellectual (1911 – 1980), correctly predicted a digital future as the ecology of our time. His description of a global village, a mosaic of information involving ‘all people with all other people', proved to be true. Antithetical to our current 24/7 information cycle, Languages of the Heart presents work that shares a direct handmade aesthetic unmediated through computers. Using an abstract vocabulary, these contemporary artists employ repetition, pattern and mark making to create singular imagery. Included in the pairings are diverse indigenous pieces ranging from an embroidered cornhusk bag, painted rawhide parfleches, beaded leggings, a wooden navigational tool, a bird-shaped clay pot, and beaded belt pouches. These works are all utilitarian objects, containers of some kind, made for personal use or to sell in the marketplace. Using both handmade and commercial materials each object is skillfully embellished with color and design which differentiates the individual maker but also reflects the particular people. The fluid boundary between arts and crafts, hand and heart binds both bodies of work. ​In Cat Balco's painting, Blue Diamond Orange Shine, an eight-sided star holds center stage. Her performative painting process, using large household brushes loaded with liquid paint, reinforces the centripetal centrifugal nature of her work. The end result is fast action captured to create a slow mandala-like read. The 19th Century Crow parfleche selected was used as 'luggage' to contain clothes, dried meats, pemmican and other items. Coincidently, both works employ a similar color structure and geometric play. ​Slapstick humor is implied in Laurel Farrin’s, Blue Heels, a painted wall hanging composed of unprimed canvas with real shoe heels attached. This soft sculptural object poses as a polka dot update to the hide, beads, and cloth of the paired 19th Century Cree leggings. Attention to color, material and pattern connects both pieces. In Farrin’s case, the gap between function and image gives the work an animated quixotic quality as if someone had danced away, leaving their shoes behind. ​In Glenn Goldberg’s painting, Untitled, multicolored triangles range over four horizontal bars, appearing like notes in a musical score. The work is composed of hundreds of pointillist dots staccato in nature. An irregular color structure mediates the overall symmetry. The diamond patterned 19th Century Lakota parfleche carries a similar off-kilter rhythmic feel achieved by gestural mark making and its slightly irregular three-dimensional form. 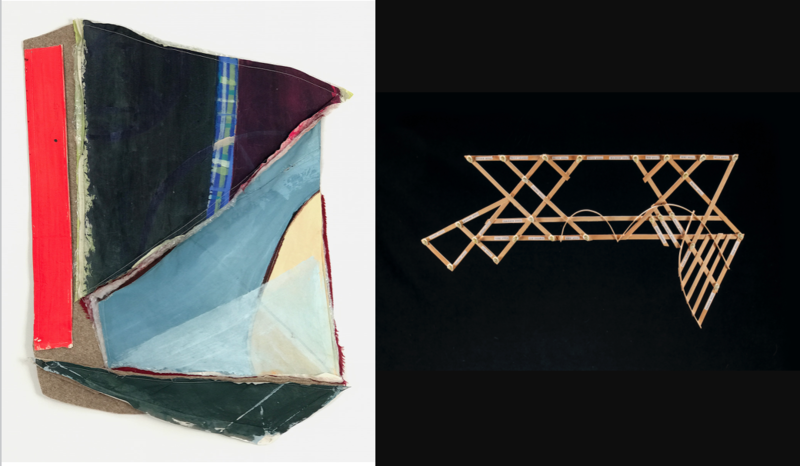 Left: Lakota Parfleche, 19th Century, rawhide and paint 12" x 14"; Right: Glenn Goldberg, Untitled, 2018, acrylic on canvas, 16" x 12"
​Jill Levine's, Checkered T, 'tablet' combines painting with sculpture while its scale and tactility share a kinship with books. The fresco-like surface, painted with a multi-colored checkerboard pattern, is overlaid with a dark symmetrical structure influenced by her extensive travels in Mexico. The handmade quality of the 'tablet' acts in contrast to the graphic quality in the painting. Another kind of intimate object is the intricately embroidered 19th Century Nez Perce cornhusk bag made with a corresponding dark and light palette. 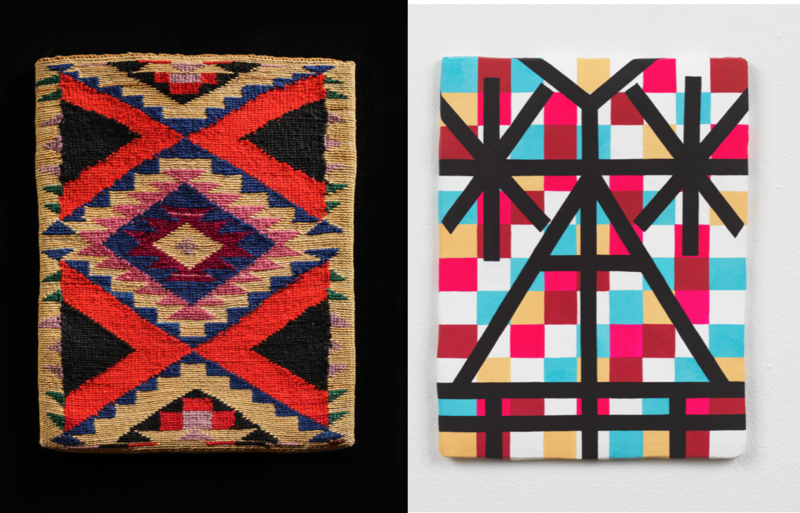 Left: Cornhusk bag, Nez Perce, circa 1890-1910; Right: Jill Levine, "Checkered T", 2018, oil on mixed media, 12" x 9"
​Lizzie Scott’s soft 'stuffed painting Untitled, co-joins color with physicality. Working in a collage format, she cuts, stuffs, sews, and paints muslin panels as components for the overall composition. With its strong vertical and diagonal elements, her stitched hybrid references architecture while reading simultaneously as object and image. Like the 20th Century Marshall Islands navigational chart, a functional guide for indigenous sailors, the pairing presents an intimation of a larger whole. ​Colin Thomson’s painting, Eye, employs grey and blue graphic characters to anchor the loosely painted ground. A secondary jazz inflected rhythm is established through a series of black shapes which mark the linear intersections. This overall structure frames a layered and receding space. In a similar way, the early 20th Century bird-shaped ceramic from the Cochiti Pueblo uses an irregular black pattern to define volume and animate the form. ​In Lindsay Walt’s painting, The Dawn Wall, blue and white prisms balance and hover while spatially shifting in and out of focus. Running throughout is an auxiliary pattern of white highlights which counteract the fan like forms. The relationship between the sensuous nature of color (particularly blue) and structure is apparent in the pairing of 19th Century beaded belt pouches from the Columbia River Plateau with their stylized symbols of four winds and horseshoes. Left: Columbia River Plateau belt pouches, 19th century; Right: Lindsay Walt, "The Dawn Well", 2018, oil and canvas, 22" x 32"